Abstract : When analyzing brain tumors, two tasks are intrinsically linked, spatial localization and physiological characterization of the lesioned tissues. Automated data-driven solutions exist, based on image segmentation techniques or physiological parameters analysis, but for each task separately, the other being performed manually or with user tuning operations. 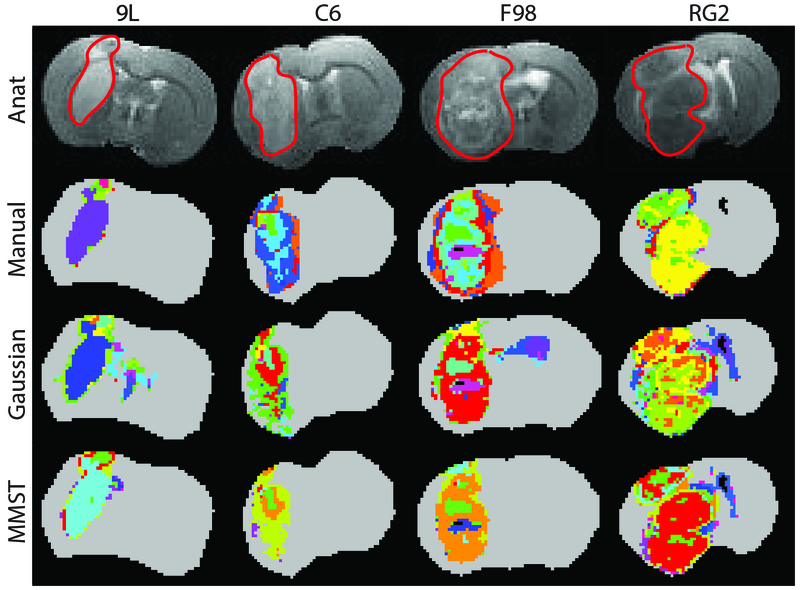 In this work, the availability of quantitative magnetic resonance (MR) parameters is combined with advanced multivariate statistical tools to design a fully automated method that jointly performs both localization and characterization. Non trivial interactions between relevant physiological parameters are captured thanks to recent generalized Student distributions that provide a larger variety of distributional shapes compared to the more standard Gaussian distributions. Probabilistic mixtures of the former distributions are then considered to account for the different tissue types and potential heterogeneity of lesions. Discriminative multivariate features are extracted from this mixture modelling and turned into individual lesion signatures. The signatures are subsequently pooled together to build a statistical fingerprint model of the different lesion types that captures lesion characteristics while accounting for inter-subject variability. The potential of this generic procedure is demonstrated on a data set of 53 rats, with 36 rats bearing 4 different brain tumors, for which 5 quantitative MR parameters were acquired.